Designs by Lisa Somerville: Life's a Beach! Welcome to the Creations by AR Design Team June Blog Hop! 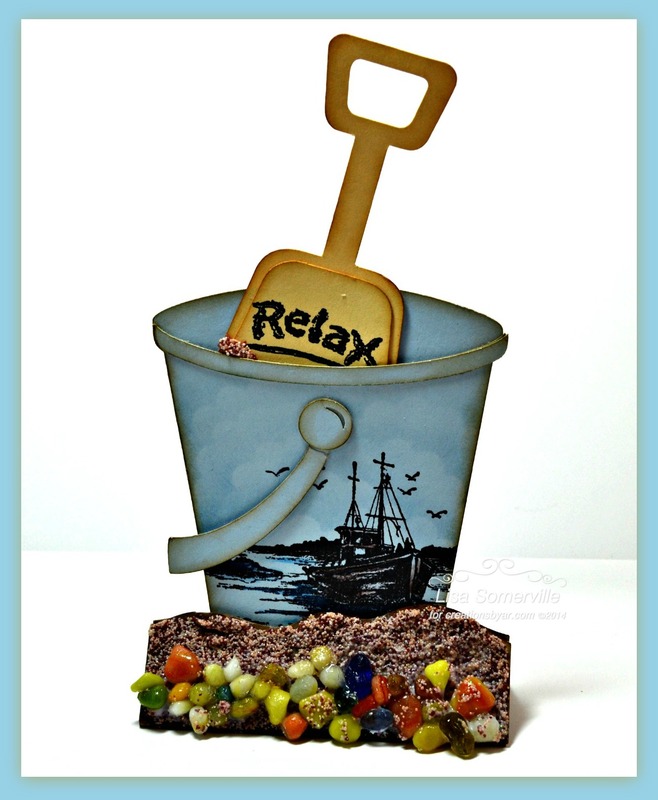 This month the Creations by AR Team members are sharing creations made with the new Sandy Beach Bucket Template and the Beach Bucket Card Template. Continue reading below to see how you can win one of these new templates! I used the Silhouette Cameo to cut the template pieces, and stamped the panels with stamps from Our Daily Bread Designs. 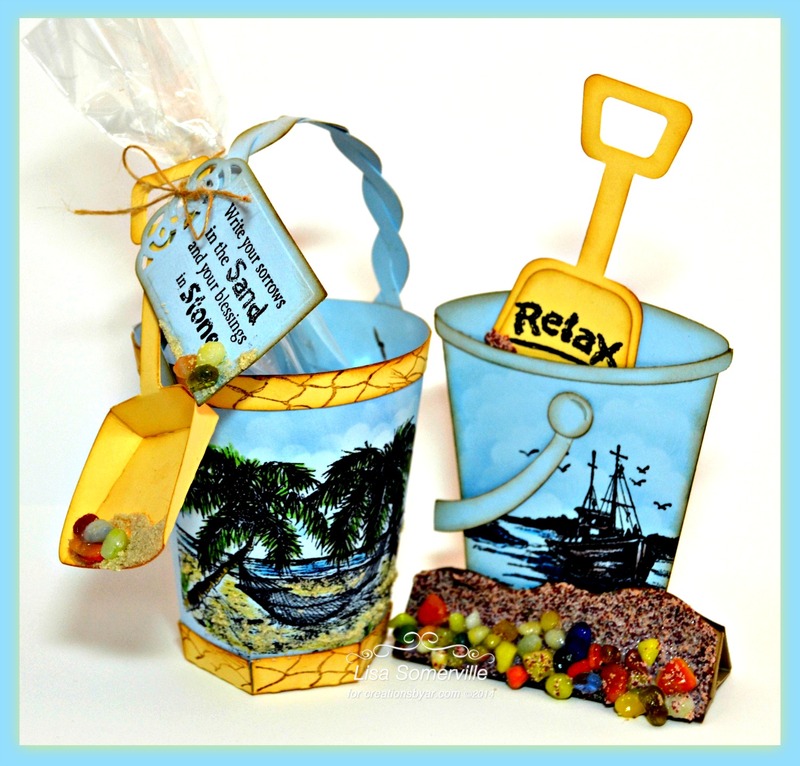 I just love these fabulous summer templates, the Sandy Beach Bucket Template makes a wonderful treat or trinket holder, it would also be cute to use as a place setting for a Summer Beach Party Dinner, or shrunk down for a Christmas Ornament. I stamped the Hammock from Our Daily Bread Designs Happy Retirement stamp set in Black Archival on the Bucket, then colored the image using STAEDTLER Karat Aquarell Watercolor Pencils. The bucket trim was stamped in Ranger Gathered Twigs Distress Ink using the Fishing Net Background. I added a stamped tag using a sentiment from the Count the Waves stamp set, die cutting the tag using the ODBD Custom Recipe Card and Tag Die. To fill in the background, I sponged Blue ink over a Scallop to create clouds. To embellish I added some Mudd Puddles Sand and Sea Glass. 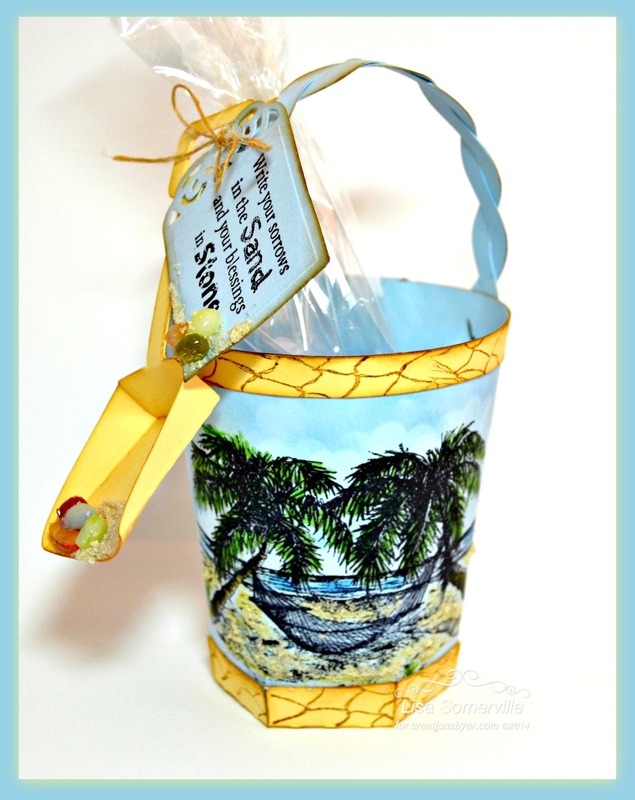 My Beach Bucket Card is stamped in Black Archival ink using the fishing ship from Our Daily Bread Designs The Waves on the Sea stamp set, colored with STAEDTLER Karat Aquarell Watercolor pencils. The shovel is stamped in Black Archival using a sentiment from the Happy Retirement set. To fill in the background, I sponged Blue ink over a Scallop to create clouds. To embellish I added some Mudd Puddles Sand and Sea Glass. To participate and be eligible to win, simply leave a comment on each designers blog hop post and/or the Creations by AR Facebook Page by Saturday, June 14, 2014, NOON EDT. This month there will be two random winners, one from the comments left on the Design Team Blogs and one from the comments left on Facebook. The random winners will be announced on June 15, 2014, on the Creations by Facebook Page and Adela's Blog. Lisa your creations for the beach are just beautiful! I love the beachy paper!!!! What beautiful stampings on your buckets Lisa! 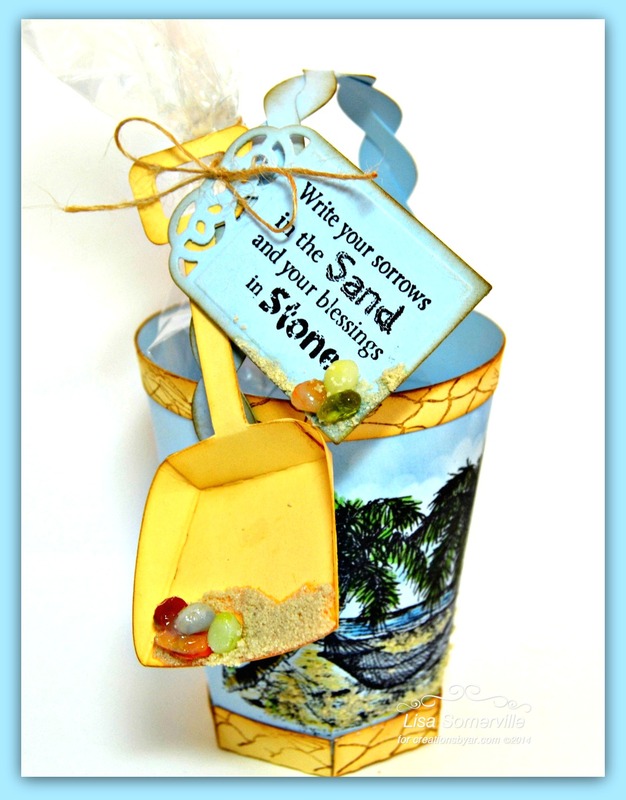 love the bright blue and yellow accent and the fun 'pebbles' on your shovel and in the sand! Love these are so nice. Love the embellishments. April Vicary....Awesome creations...Thank you for the inspiration. Love the work you all do. Wow, this is so beautiful, I really like the bright colors!! Love the addition of the sand and pebbles. Too cute! A lot of fun to add the sand & pebbles for that added texture. Love the colours too. As I was looking for your reference to the paper mfgr. I realized you stamped the designs! How very clever of you Lisa! I love the little details on the shovel and sand. So cute. Lisa, you are so clever! What a wonderful way to showcase Adela's buckets! Amazing creations, my friend!!! Wonderful job on the stamping and thanks so much for reminding me about mudd puddles. I have some just waiting to be used. They would work so well on these. Lisa, all the stamping and coloring totally makes them a masterpiece. What great giveaways to make anyone smile. TFS! OMG great job on the stamping!!! wow el diseño esta espectacular, me encanta!! ME ENCANTA LA COMBINACIÓN DE COLORES FELICITACIONES! Now isn't this just cool! Love your designs and the wonderful sentiments you used as well! Great job! amazing paper, is a fantastic design!! Beautiful projects as usual, Lisa. Love the idea about shrinking it and using it as a Christmas ornament!